Half-baked, very messy, and likely to be revised. In particular, mathematical domains, with constraints on possible combinations of structures and processes in those domains, had useful properties for organisms interacting with their environments, long before those properties were used by humans in their engineering and other activities. Sets of possibilities and constraints on those possibilities were also useful in reproductive processes and various processes of growth, control, representing and processing information, and learning. An incomplete collection of examples is presented below. Additional examples can be found in other documents on the Meta-Morphogenesis project. Biological evolution is better described as a 'Blind Theorem-Prover' than as a 'Blind Watchmaker'. "A large number of human, animal and plant viruses have protein containers that provide protection for their genomes. In many cases, these containers, called capsids, exhibit symmetry, and they can therefore be modelled using techniques from group, graph and tiling theory. It has previously been assumed that their formation from the constituent protein building blocks can be fully understood as a self-assembly process in which viral genomes are only passive passengers. Our mathematical approach, in concert with techniques from bioinformatics, biophysics and experiment, provides a new perspective: It shows that, by contrast, interactions between viral genome and capsid play vital cooperative roles in this process in the case of RNA viruses, enhancing assembly efficiency and fidelity. We use the graph theoretical concept of Hamiltonian path to quantify the resulting complexity reduction in the number of assembly pathways, and discuss implications of these insights for a novel form of anti-viral therapy." An implication is that the reproduction process for such a virus does not require all details to be specified by the genome because the symmetries in the construction constrain possible ways in which the components can be assembled, enormously reducing the number of decisions that need to be made about where molecules should go. I think this also illustrates some of the ideas of Brian Goodwin about laws of form constraining products of biological evolution, rather than everything being a result of fitness requirements. Some of those ideas come from earlier work by D'Arcy Thompson, Goethe and others. See Boden (2006) Sections 15x(b-d), Vol 2, for more on this. However, I want to go further and suggest that the processes of natural selection often discover mathematical domains that can be put to use not only during morphogenesis/epigenesis, but also during the ongoing functioning of individual organisms. A simple example that is re-used in many contexts is the mathematics of homeostasis (control by negative feedback loops). There are probably many more examples of biological mechanisms that make use of mathematical structures waiting to be discovered, including the mechanisms that first enabled humans to discover and prove theorems, e.g. in geometry and arithmetic (long before geometry had been mapped into arithmetic and algebra, and long before the development of the axiomatic method based on logic). 27 Oct 2016: Extended the analogy of evolution as blind theorem-prover by characterising the relations between the fundamental construction kit and all derived construction kit as closely analogous to proposed relationships between foundations of mathematics and all derived kinds of mathematics. Some of the more closely related material on this web site is indicated below. Mathematical competence appears at first sight to be a uniquely human phenomenon, though there are researchers who attempt to show that some other species have rudimentary arithmetical, or spatial, reasoning competences. Other researchers have designed computer-based machines that not only calculate much faster and more reliably than humans, but can also discover proofs of complex theorems, outperforming the vast majority of humans, if not all. I shall try to show that the view of mathematics as somehow a creation of human minds, apparently proposed by Wittgenstein, and regarded as plausible by some other researchers, is seriously erroneous, mainly because there are many mathematical domains whose existence has nothing to do with the existence of humans, some of which were used by evolution to produce organisms that existed long before there were humans. Some mathematical domains are instantiated in environments in which humans and other animals act effectively, though in many cases without understanding why their actions work. So they have what could be called 'pre-mathematical competences' (several discussed in connection with 'toddler theorems' here: http://www.cs.bham.ac.uk/research/projects/cogaff/misc/toddler-theorems.html This explains why natural selection favours some evolutionary transitions that provide or improve pre-mathematical competences, since such competences make members of those species better able to meet their biological needs. But there are also many design features of organisms that enable results to be produced, or malfunctions to be avoided, because of constraints in mathematical domains used by those designs: resulting from 'choices' by natural selection rather than by individuals. There are many mathematical domains of many kinds and sizes. There are infinitely many of them because new ones can always be created out of old ones. And many many more, some of them mentioned below. The existence of those mathematical domains, far from being a product of biological evolution, or human culture, is a precondition for evolution and cultural development. More generally, the possibility of biological mechanisms and evolution of those mechanisms depends on the existence and reliability of physical mechanisms that achieve reproduction and maintenance of complex structures, discussed in more detail in Ganti (2003) (compare Kaufmann (1995)). (NB. Reliability does not need to be perfect.) Brian Goodwin's claim that there are "Laws of Form" constraining evolution, as proposed earlier by D'Arcy Thompsoni s relevant here. Natural selection seems to be capable of (blindly) discovering the existence and importance of mathematical domains and (blindly) "compiling" those discoveries into successful designs for organisms in particular environments. The evolutionary trajectories leading to production of such designs constitute (blindly generated and totally unrecognized) "proofs" of (instantiated, but unstated) "theorems" about the possibility of various solutions to hard design problems. Later, natural selection produces better, faster, theorem-discoverers in the form of organisms that themselves can find solutions to design problems, through learning mechanisms that allow individuals to design new behaviours. This too can be done "blindly" -- the organisms making the discoveries have no idea that they are doing so. Later still, natural selection produced a succession of increasingly sophisticated forms of meta-cognition, that allowed the discoverers to notice, reflect on, test, communicate, discuss, debug, and teach what they have discovered, in part with the help of social/cultural evolution. Later still, these discoveries were organised into cultural products of many kinds including perhaps the single most important one of all: Euclid's Elements. Later on new domains including domains related to representation and reasoning were discovered (e.g. various forms of logic and logical inference), then domains of mechanisms capable of making use of those domains to do mathematical reasoning and even to make mathematical discoveries. This included 19th and 20th century developments in logic, meta-mathematics, theory of computation, and then computer science, computer systems engineering, and AI. Some of these ideas were absorbed, though in seriously inadequate forms by other disciplines, including philosophy and psychology (cognitive science). The processes involved in reproduction, growth or repair and the processes of provision and use of energy in organisms all have mathematical structures, and the mechanisms that reliably achieve those functions also have mathematical structures. It is only because the physical world is capable of supporting mechanisms that reliably operate within mathematical constraints that complex enduring molecules and more complex multi-functional chemical structures required for life exist, endure, replicate and diversify. Life forms exhibit a tendency to "diversify". Living things do not all conform to some one pattern: there is enormous, and continually changing, diversity of structures and behaviours. That's not only diversity in the organisms themselves (diversity of designs) but also diversity in the challenges and opportunities provided by the environment (diversity of niches). Moreover there are constant changes in both designs and niches (sets of requirements for the designs to satisfy) with complex feedback loops driving ever increasing complexity and diversity of both, as crudely indicated in this diagram of design space and niche space and the complex and varied types of "satisfaction" relationships between niches and designs (as opposed to a scalar "fitness" value applicable to all types of organism). 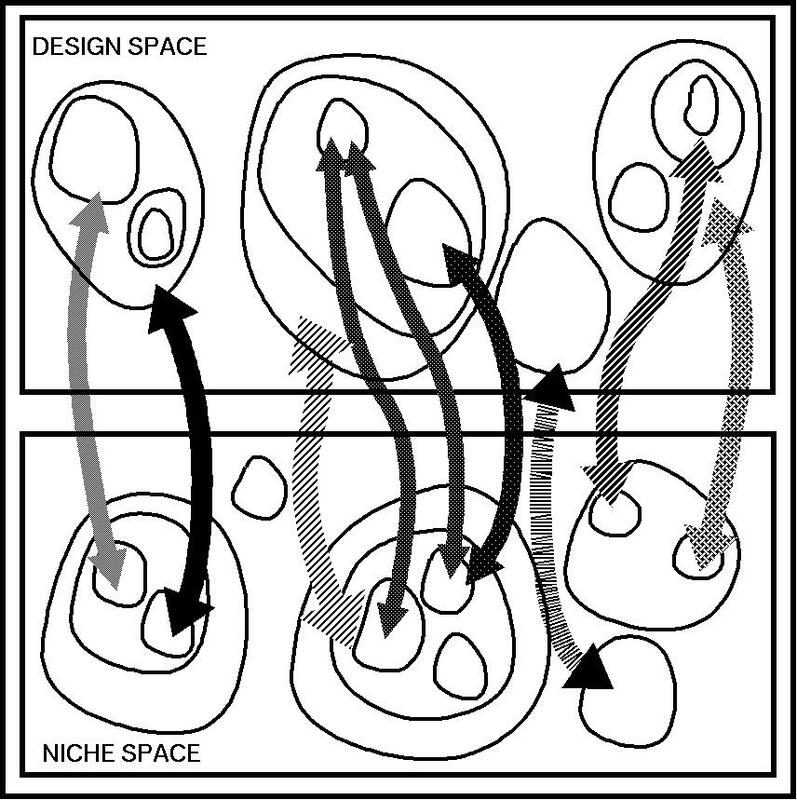 There are different sorts of trajectories through these spaces, as designs and sets of requirements (niches) change. Some of the trajectories are followed at the species level, driven by natural selection and possibly other mechanisms (e.g. breeding). 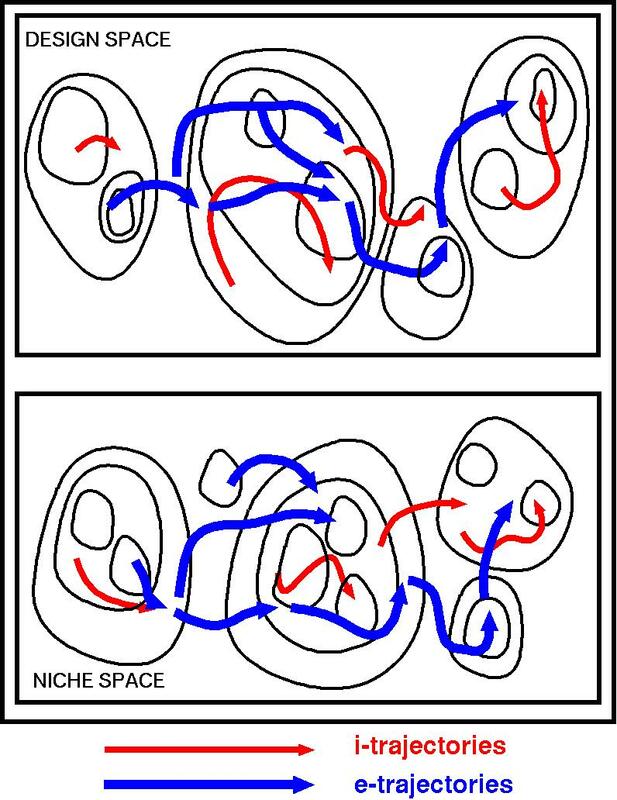 There are also trajectories in spaces of designs and requirements during development of individuals (epigenetic trajectories), partly controlled by what's in the genome, and partly by what's happening in the individual's environment. Individual trajectories and group/species trajectories. All the designs, all the niches, all the behaviours, all the relationships between designs and behaviours and between designs and niches and between behaviours and niches are instances of mathematical domains, though some of the domains are static for a while, whereas others keep changing, and there is enormous diversity. Life is not just one pattern instantiated in all species and all niches. That last statement about domains changing is imprecise and potentially misleading. The instances of domains can change while remaining instances, if the domains have sufficient generality. However, for some of the changes in challenges or requirements and changes in solutions there are major domain transitions. We may need to develop a new language to express all this, though some of the work already done in computer science, concerned with formal specifications of requirements, designs, implementations and behaviours may prove relevant. Compare Sloman and Vernon (2007). A metaphysical precondition for all this is that there are very many (actually infinitely many) 'domains' of possible structures and processes about which information can be acquired, including 'meta-domains' of various kinds. The fact that domains can to some extent be 'chunked' and mastered separately is a requirement for the evolutionary and learning processes to be tractable. Moreover, the domains are not all uniformly and efficiently specifiable in a common notational framework, although some domains can be modelled in others (or in each other). Domains connected with geometrical and topological reasoning required evolution to develop mechanisms that we (and many other species) all use, but at present nobody seems to understand them (i.e. the meta-cognitive transition is seriously incomplete); and that is proving a serious obstacle to progress in AI, because successful visual and motor interaction with complex spatial structures (e.g. crows building nests) are impossible or very difficult without special spatial reasoning mechanisms. Current robots that have been trained to perform skilled, actions, usually after much training, such as catching balls, hitting balls, picking things up, and many more, are not able to think about what their actions achieve, how they achieve them, what alternatives would work, under what circumstances they would need to be modified, and what the baby robots who can't catch balls have not yet learnt. In other words, as many organisms, including insects, and also current robots demonstrate, expert on-line intelligence (practical intelligence) is possible without off-line (mathematical, reflective) intelligence. Unfortunately non-mathematicians often have an extremely narrow conception of mathematics, perhaps related to what they were taught in an impoverished mathematical education, which may have included arithmetic, a little algebra, and some memorised geometrical theorems and trigonometric formulae, with a little statistics added if they are empirical researchers. In particular, we need a broader conception of mathematics based on the huge diversity of types of research in mathematics, which goes far beyond arithmetic and geometry (including, for example, theories of grammars, language types, computational systems, logic, transfinite ordinals, probability, games theory, and many others). There are systematic ways of generating new mathematical domains from old ones, by adding or removing components of old ones, or combining domains, or abstracting from details. Some examples are given below. A fairly broad overview of the scope of mathematics is provided by Wikipedia: http://en.wikipedia.org/wiki/Mathematics though it does not mention the role of mathematical competences in organisms that are not able to think about what they are doing or communicate it. Research by human mathematicians into all those areas of mathematics is possible because they have special collections of biological competences, all of which are products of biological evolution, including products of cultural evolution, since cultural evolution is a product of biological evolution. Many of these competences are based on earlier (proto-mathematical) competences shared with other animals. For example, abilities to perceive and reason about spatial structures and processes, abilities that are shared with other species, seem to be essential for the human competences that led to the discovery of Euclidean geometry. What drives the continuing evolution of those competences is the fact that the world is full of mathematical structures, mastery of which can produce biological benefits, whether in making nests, finding routes, communicating with conspecifics, or solving other practical problems. Biological developments continually produce new layers of mathematical structures, which in turn can provide new mathematical challenges for the species involved, or their rivals or prey, predators or co-habitants. This in turn provides new opportunities for natural selection to extend previous mathematical competences. Human mathematical competences are a special case. Human and non-human mathematical competences are often modelled in computing systems, for example in calculators, proof checkers, theorem provers and other tools. However, not all have been modelled, either because nobody has tried or because they are far more difficult to specify or model computationally. The sort of geometrical reasoning that led to Euclid's Elements, and the precursors in our ancestors and in other species are examples: it has proved extremely difficult to give machines these abilities. I think that is in part due to the fact that the abilities have not been characterised accurately. What makes all this mathematical activity possible is the existence of mathematical structures, most of which are neither anthropological nor biological products -- except for cases where the structures are products, or possible future products, of biological evolution. For example, simple arithmetic is related to the existence of one to one mappings between sets and operations on sets that produce new mappings. Biological evolution did not produce sets of objects or one to one mappings between sets or or parts of sets. But it did produce cognitive systems that are capable of learning to reason about such sets and mappings. Likewise the existence of euclidean and non-euclidean geometries owes nothing to biological evolution, or humans, though the human abilities to learn about and prove theorems about geometrical structures, are products of evolution. A key to understanding this is the concept of what some people call a "domain", or a "microworld", about which more will be said later. There is a vast amount of research on learning in animals and machines, but very little of that is, as far as I know, concerned with discovery of new domains followed by mastery of those domains. Instead the focus is usually on learning and use of regularities within a domain that the researchers take for granted, e.g. a domain of sensory patterns and a domain of motor signals, or a domain of movements in a particular spatial configuration. Yet a great deal of animal intelligence depends on either evolved or learnt competences relating to new domains, which were irrelevant to, or not used by their ancestors, or earlier developmental phases. For example, the domain of movements in extended terrain is irrelevant to the actions of newborn mammals incapable of locomotion, and the domain of air-born movements through branches of trees is irrelevant to the wingless ancestors of birds. The domains of structures and processes relevant to survival and reproduction are different for different organisms. For example, an organism that senses some properties of the environment and that can perform actions that may cause those properties to change, may evolve collections of condition-action ``rules'' that encode a primitive collection of domain-specific competences, for instance homeostatic competences. But if an animal can move and inhabits an environment whose contents are different in different locations, then the animal may find it useful to be able somehow to reason about structures and relationships in the environment and how its actions can change them in new ways. That includes reasoning about new routes between locations in the environment, possibly instantiating a mathematical domain of graphs with weighted links between nodes. Human mathematics is a product of many biological processes interacting with vast numbers of "domains" that organisms need to master in various ways. The early achievements were produced by evolution, then later by associative (statistical) learning, then later by other processes involving meta-cognition, then collaborative (social processes) then co-ordination through formal educational and research structures. The instances of domains may be produced in many ways: physical and chemical processes, evolutionary processes, activities of individual organisms, interactions between organisms, types of environment in which organisms evolve, learn, perceive and act, cultural processes, individual intentions. But the types of which they are instances existed earlier, insofar as the instances were possible before they actually existed. The Preface grew too large, so it is now growing even larger, on its own. When will the first baby robot grow up to be a mathematician? Ian Hacking recently reminded me that Wittgenstein wrote, in Remarks on the Foundations of Mathematics (1978: VII '33, p. 399) "For mathematics is after all an anthropological phenomenon." I think that's a step in the right direction, but the step is much too short. A bigger step in the right direction would describe mathematics as a biological phenomenon. I shall try to describe a deep, but largely unnoticed, collection of relationships between biological evolution and various forms of mathematical, pre-mathematical, meta-mathematical and philosophical reasoning capabilities, geometrical reasoning being an important special case. philosophical capabilities used in thinking or arguing about the nature of mathematics. (d) the apparently never-ending possibility of creating, or discovering, new domains by modifying or combining old domains, or by forming new meta-domains by abstracting from details of previously known domains. This means that any complete philosophy of mathematics, including answers to "What is mathematics?" "What makes it possible?" must discuss -- opportunities for, and constraints on, biological evolution, -- structures in the world that evolution reacts or responds to, and -- later products of evolution building on older ones, including evolved abilities to by-pass evolution, through learning, a much faster process. This seems to be a never-ending process of growth. The myriad possibilities for biological structures and processes are rooted in very general physical/chemical features of the universe and particular historical conditions in various portions of the universe. Human mathematics is rooted in biological phenomena, and grown in stages, initially mainly by natural selection, starting with micro-organisms whose information-based control mechanisms evolved so as to engage with increasingly rich mathematical features of structures and processes in the environment. Some of those mechanisms have recently been modelled or replicated in computer-based machines capable of logical, arithmetical or algebraic reasoning. These competences seem to have developed relatively recently in humans. Paradoxically, some of the much older forms of reasoning, apparently shared with some other animals, have so far resisted computer-based replication, as mentioned above. Later, as organisms became more complex, and their environments changed, new forms of information-processing became increasingly useful, to address increasingly complex challenges and opportunities presented by the physical world and its occupants, non-living and living (including predators, prey and new sources of plant food), along with new challenges and opportunities continually presented by results of earlier evolutionary developments that provided new sensors, new manipulators, new information-processing capabilities, new problems of learning and control, and new forms of mathematics implicit in the information-processing strategies. Some of those transitions in information-processing are listed in this document. Although some species successfully existed for many millions of years with little change, because their niches changed little, others acquired new forms of information-processing driven by evolution, combined with processes of learning, development, and social/cultural change. The key point is that such changes, both in the challenges and in the responses, involved alterations or extensions in the mathematical structures of physical, biological, social, and mental processes in organisms. Those changes enabled them to cope better with, or cope with a wider variety of, naturally occurring problems. For the purposes of this discussion, John McCarthy was right to suggest in (1979) that thermostatic control processes are examples of primitive mental processes, implemented in physical or chemical processes. The information-processing requirements became ever more demanding as control problems became more complex, e.g. going beyond switching something on or off, to increasing or decreasing something (speed, angle, a gap between claws), then to modifying the rate of increase or decrease (i.e. acceleration or deceleration), then perhaps moving from scalar changes to structural changes (e.g. changing relationships between parts of grippers and parts of objects gripped), possibly requiring more parallel control functions (biting while chasing, climbing while holding a baby) ... . So, changing mathematical properties of niches or task demands, led to changing mathematical properties of information processing mechanisms and the behaviours they produced. Many more examples were investigated in relation to child development by Piaget, including examples in his last two books, on Possibility and Necessity, closely related to our topic -- partially reviewed here. (Added 25 May 2013, Updated 28 Jun 2013)What is a domain? The idea of a "Domain" is very important for the thesis summarised here. I'll sometimes use the label "micro-domain" (or "microdomain") for a domain whose size and scope is very limited, though there is no sharp boundary implied between micro-domains and other domains. At some future date a better theory of types of domain, and the cognitive challenges and opportunities they provide for their inhabitants, their users, and individuals learning about them, will be needed. For now I'll present a compressed intuitive introduction with no pretense at precision or completeness. Several examples of domains related to her ideas are discussed in Butler (2007). It seems clear that her notion of representational redescription is closely connected with the examples I have been giving of types of (proto-)mathematical discovery of which most humans, including toddlers (as described here), are capable, whether they are aware that they make the discoveries or not. First approximation: a domain is a class of possible structures or processes that can be created and manipulated, either physically or "in thought" (by thinkers with appropriate representational/information-processing capabilities). Physical domains contain perceivable structures and processes, some or all of which may also be manipulable, for example, configurations of rocks, or piles of sand, or bricks, or sounds produced either vocally or by manipulating objects in the environment. There are also abstract domains such as domains of sets of numbers and arithmetical processes transforming those sets. NOTE: (28 Jun 2013) For quick introductions to many domains see Vi Hart's amazing high speed online math-doodles. Although I have not noticed her using the term "domain", she finds small, fairly closed, domains everywhere, including various familiar bits of mathematics from arithmetic and geometry, but also in physical structures and transformations, e.g. folding an sheet of paper repeatedly, tying long thin balloons together, arranging furniture, patterns in "dances" performed with fingers and thumbs, etc. My point is that these are crystallized sample fragments from a much richer space of domains whose instances include spatial structures and processes and also more abstract structures and processes in mathematics and in information processing mechanisms. The existence of a domain, and even the causal role of a domain, need not depend on anyone having noticed or thought about the domain. For example the (vast) domain of possible chemical structures and processes possible very early in the history of this planet made it possible for the earliest forms of life to come into existence Ganti (2003), but nobody had to be around to think about what was happening. Some domains contain only structures and processes that are products of purely physical processes, e.g. domains of ocean waves or shadows of clouds on a lifeless planet, or planetary motions; while other domains have physical structures and processes produced intentionally or unintentionally by humans or other animals, such as: paths in a forest, sand-castles, patterns made with elastic bands and pins, sentences, poems, piano sonatas, or numerical calculations. The sets of structures and processes that are possible in principle in this universe are enormously varied, and the set of domains of structures and processes that are theoretically possible is unbounded, even if the set that could be instantiated physically is bounded in various ways, including space available, durations of processes, numbers of physically distinct components, etc. The set of domains that can be thought about includes some whose instances could not exist physically, for example, a domain containing arbitrarily long, infinitely thin, rigid linear structures that can transmit forces. For now I'll leave aside the question whether a mathematical continuum exists in physical space. Instances of a domain will typically be complex objects made of parts standing in various relationships, or complex processes in which objects change properties and relationships, and possibly come into or go out of existence, either through processes of assembly and disassembly of complex wholes, or through appearance or disappearance of 'basic' components. Processes in a domain can include addition or removal of parts of an instance, or alterations of the properties or relationships of some or all of the parts. Often a new domain can be defined by combining domains, for example, the domain of problems of interpreting 2-D line drawings as depicting 3-D configurations of opaque polyhedra (as in the work of Huffman, Clowes, Waltz, Martin, and others [Add REFS]), or the domain of processes of production of verbal descriptions of pictures, or things depicted, or processes of generating pictures from verbal descriptions, or mathematical specifications, or the code for drawing programs. Some domains are totally discrete, such as the domain of configurations of zeros and ones in a 2-D array. Others are continuous, such as the domain of shapes and processes that can be created by rearranging a piece of string on a flat surface, without any crossings or contacts of two parts of the string. Extending the domain to include points where one part of the string crosses or touches another part introduces discontinuities into the domain. A domain of blocks of different heights arranged in a row can be thought of as discrete if only the possible orderings are considered, whereas it includes both continuous and discrete change if spatial processes in which blocks are moved from one location to another so as to alter the ordering are included in the domain. Many more are found in the various sciences, in various branches of mathematics, in art forms, and games of various kinds and in the space of possible human languages. Most normal humans, beyond a certain age, seem to be capable of inventing both new instances within a previously known domain (if the domain's contents have not yet been exhaustively listed), and many can also invent new theoretical domains such as might form backdrops to fantasy adventure stories. Domains of the sorts referred to here, sometimes referred to as "micro-worlds" have often been the subject of study in Artificial Intelligence, in projects concerned either with explicitly programming computers to have competence in a domain (e.g. 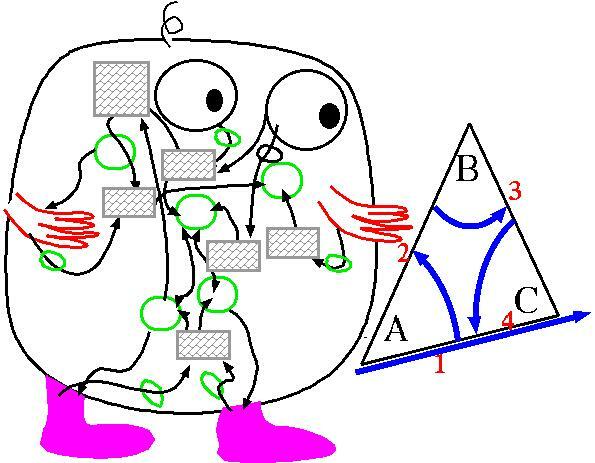 interpreting line drawings as depicting 3-D polyhedral scenes) or investigating ways in which a computer (or robot) can acquire such competence as a result of some sort of training process, or a process of exploration and experiment driven by the robot rather than a tutor presenting examples. Domains may be naturally occurring or artificial -- devised for educational or other purposes. A fairly complex domain my colleagues and I created as a challenge for robot vision, manipulation and learning is the "Polyflap" domain, most of which is still far beyond the competences of current robots. Many domains, some explicitly recognized as such and some not, are associated with board games, sporting activities, musical activities, domestic rituals and chores, and, of course branches of mathematics, some discovered centuries ago (e.g. arithmetic and geometry), others noticed only very recently, e.g. group theory, boolean algebra, and theory of formal grammars. "At this point we made an additional assumption. The bases can theoretically exist in a number of forms depending upon where the hydrogen atoms are attached. We assumed that for each base one form was much more probable than all the others. The hydrogen atoms can be thought of as little knobs attached to the bases, and the way the bases fit together depends crucially upon where these knobs are. With this assumption the only possible pairs that will fit in are: adenine with thymine and guanine with cytosine. Adenine must always be paired with thymine, and guanine with cytosine; it is impossible to fit the bases together in any other combination in our model. (This pairing is likely to be so fundamental for biology that I cannot help wondering whether some day an enthusiastic scientist will christen his newborn twins Adenine and Thymine!) The model places no restriction, however, on the sequence of pairs along the structure. Any specified pair can follow any other. This is because a pair of bases is flat, and since in this model they are stacked roughly like a pile of coins, it does not matter which pair goes above which. It is important to realize that the specific pairing of the bases is the direct result of the assumption that both phosphate-sugar chains are helical. This regularity implies that the distance from a sugar group on one chain to that on the other at the same level is always the same, no matter where one is along the chain. It follows that the bases linked to the sugars always have the same amount of space in which to fit. It is the regularity of the phosphate-sugar chains, therefore, that is at the root of the specific pairing." This is an example where one common feature of a class of physical structures phosphate-sugar pairings in helical chains (DNA molecules) makes certain configurations impossible (varying distances between sugar groups) and thereby makes possible a class of molecules that vary in detailed contents, whose relationships cannot vary. This mathematical constraint has many implications, including making possible a uniform mechanism for replication of the structures, in development of an organism, and also a uniform mechanism for combining genetic materials from male and female parents. This description over-simplifies the mathematical complexity of the chemistry, but illustrates the main point: superimposing a particular mathematical constraint on a large class of possibilities can restrict the possibilities in a way that creates a new possibility: a regular mechanism of structure formation whose products share important mathematical features, which in turn, make new structures and constraints possible. Similar points were made by Erwin Schrödinger's in "What is life?" (1944), with implications regarding the possibility of very large and complex, yet highly stable molecular structures, required for transmission of biological information across generations. This sort of use of mathematical domains with classes of possibilities and impossibilities, which can be used to generate new such domains occurs both in the mechanisms of reproduction and development and later on in the use of information in control and decision making processes by organisms deciding what to do on the basis of various kinds of information, about their current state, their needs, and opportunities and constraints provided by the environment. My claim is that all organisms are confronted with domains of structures and processes, of various kinds and various degrees of complexity, implicitly specified by relationships between aspects of the environment in which they exist, perceive and act and by their own physical competences and their information-processing competences required for use of sensory information and for initiation and control of behaviours. It seems that both Karmiloff-Smith and I have been independently thinking about various sorts of domain relevant to cognition and cognitive development in humans and other animals, in which we have both been heavily influenced by the work of Piaget. My interest, unlike hers, was largely driven by problems in the philosophy of mathematics, going back to my 1962 DPhil thesis. It is very likely that many people in many different disciplines have noticed the psychological and pedagogical importance of domains, probably using different terminology for them, though I am not aware of a previous attempt to use the idea of a domain as a bridge between biological evolution and philosophy of mathematics. The transitions required to meet these challenges include: development of new forms of representation of information (including chemical, neural, behavioural, encodings, and creation of information structures in the environment, e.g. pheromone trails, worn tracks, distinctive nests and hives, etc. ), development of new information-processing mechanisms to make use of these forms of representation, development of new ontologies extending previous semantic contents, and development of new information-processing architectures, including virtual machine architectures, capable of combining multiple cooperating information-processing mechanisms and capabilities. For example, the mathematical properties of continuous feedback control systems in homeostatic mechanisms are different from the mathematical properties of persistent information structures recording spatial layout of important locations in the environment (nest, food sources, obstacles, paths, etc.). The mathematical properties of linear grammar-based information transmissions and their semantic contents are different from both. We can now see the need for differential equations, for graph structures, for logical formalisms, whereas the problems were invisible to our ancestors, and even to most contemporary humans, who study no mathematics, logic, or computer science. Some of the biological mathematical competences may have evolved several times, in different contexts, sometimes merged later on, sometimes not, including abilities to cope with and reason about sets, about measures (e.g. of time, length, area, volume, angle, weight, speed, force, and many more), about rates of change, about cardinality, about orderings and partial orderings. Information about unbounded processes (indefinitely getting smaller, thinner, longer, straighter, more curved, etc.) may have come from the disadvantages of pre-specified bounds or limits in forms of representation (as I think Kant noticed). The meta-mathematical modes of thinking and reasoning required to describe and compare all those are very recent mathematical products, on this planet. But some have very old pre-cursors. For history of human communication technologies see Dyson (1997). In principle, not only is it possible for human cultures to discover and engage with different mathematical domains, or sub-domains, it is also possible for other species to discover and engage with domains relevant to their forms of life, including for example, animals that live only in deep water, or shallow water, animals that spend most of their life in flight, animals that lack a vision system, and so on. So it is true only for a subset of mathematics that it is an anthropological phenomenon, and even that subset is beginning to be extended by machines blazing trails that humans cannot follow. a collection of "engineering solutions" to biological problems about structures and processes -- especially problems concerned with information, and how it can be processed; along with problems that have not yet been solved and a collection of strategies for generating new problems. There will also be infinitely many mathematical domains (most of which are themselves infinite) that have not yet been "discovered" or found useful in this way, and some that never will be for a variety of reasons. Not all the problems are identified by human engineers, or other animals, since many are implicitly identified by natural selection including problems that arise out of previous discoveries and solutions, often only partial and limited solutions at first, but with increasing power and generality over time (sometimes millions of years). Later on, humans (and perhaps also in limited ways some other animals) were able to notice and explicitly think about the problems and make use of solutions they had previously been using unwittingly. Such self-discovery processes may emerge from "bug-fixing" processes, as in Sussman (1975) or the need to help one's offspring do things themselves, and probably other processes of self-discovery. Many biologists, neuroscientists, philosophers, and AI/Robotics researchers assume that biological information processing mechanisms are mainly concerned with processes of recognition or classification used in discovery of regularities in the form of correlations that can be learnt from examples and in some cases encoded as probabilities because the correlations have exceptions. Newly discovered possibilities need not all be construed as exceptions to regularities. Only humans, it seems, have, in addition, developed the metacognitive and meta-semantic capabilities required for thinking about what they have learnt, noticing what others have and have not learnt, and helping others to learn. Discussing the problems, criticising and combining alternative solutions, noticing and mending flaws, all require very sophisticated biological mechanisms, of types summarised below, not yet replicated in reasoning machines. After the processes of exploration, discovery and reasoning themselves become subjects of exploration, discovery, reasoning and education, we have what is recognisable as mathematics. Before that happens, some individuals may acquire competences and knowledge that could be described as 'proto-mathematics', as in the examples of "toddler theorems". There are many discrete transitions in the development of such knowledge and competences, often not noticed by psychologists or ethologists untutored in philosophy of mathematics, investigating understanding of numbers or geometry in children or non-human animals (e.g. failing to distinguish diverse aspects of number competences, such as understanding of numerosity, cardinality, and ordinal structures). Often, areas of mathematics, and the associated human mathematical abilities, turn out to be capable of generating their own new problems, and, in some cases, solutions, for example the problem of developing an economical extendable notation for cardinal numbers, problems of solving simultaneous equations, or problems of propagating length and angle constraints across geometrical configurations, solved by use of trigonometry. Which mathematical (and meta-mathematical) competences concepts and knowledge exist at any time in any group of individuals is a product of biological evolution combined with individual development, and individual and social learning. That is always a subset of a larger mathematical space in which new challenges await attention. Opinions differ regarding the diversity of mathematics. At first sight geometrical, arithmetical, and logical concepts and knowledge are very different, yet Descartes showed how geometry could be embedded in arithmetic, and Frege, Russell, and Whitehead showed how (up to a point) arithmetic could be embedded in logic. Despite such discoveries, the domains are very different -- as the examples of reasoning about triangles in the triangle paper should make clear. Mathematics, much more than politics, is the art of the possible, including the study of constraints or limitations on possibilities -- e.g. it is not possible for a set of objects to have a one to one correspondence with two different initial sequences of numerals, one when counted left to right and one when counted right to left. Discovering the scopes and limitations of different sets of possibilities typically requires much play and exploration. Some of the domains explored by children have not yet, as far as I know, been comprehensively mathematicised, for instance what happens when one plays with different kinds of stuff (matter) as recommended in Sauvy & Sauvy. Other domains about which young children and presumably many other animals learn, such as how visual information travels and can be blocked or unblocked, reflected or refracted, have been extensively studied, in geometrical optics. The importance, in mathematics, of collections of possibilities ("domains") has been eclipsed in philosophical discussions by the apparent centrality of necessity in mathematical truths. That leads to puzzles as to the source of the necessity, and several far-fetched answers have been proposed including the suggestion that all mathematical necessities come from logic, or from human decisions. I think it is best to frame the questions in terms of constraints on possibilities. In that case we can ask how the structure of a set of possibilities allows some possibilities and not others. Then, using the equivalence between 'Necessary(p)' and 'Not(Possible(Not(p))', we get explanations of mathematical necessities from the impossibilities of various structures and processes, for example the impossibility of making a polygon with three sides that does not also have three vertices. Mathematical competences are (among other things) solutions to the biological problem posed in the final chapter of Craik (1947) of enabling animals to reason about possible actions instead of having to perform them. Some of the kinds of reasoning that lead to Euclidean geometry are illustrated in the main body of this paper in connection with reasoning about possible ways of deforming triangles -- a human capability that has proved hard to implement on computers, for reasons that are not clear. But as far as I know Craik did not notice the importance of abilities to reason about what is impossible, or equivalently, what some of the necessary consequences will be of realising some possibilities. Elsewhere I try to show how such reasoning is involved in use of information about affordances, and could later lead to evolution of mathematical abilities to detect necessary relationships between types of affordance, leading eventually to the mathematical discoveries in Euclid's Elements. In order to understand how such mathematical reasoning is possible, we need a very clear understanding of what the problems are, whereas philosophers mostly try to understand the solution(s) without understanding the original (biological) problems, and that leads to narrowly focused, or inaccurately focused, theories about the nature of mathematics, for example asking how a child reasons using laws of logic or geometry, instead of asking how a child might discover such a law in particular instances. Kant, perhaps, was an exception, though limited by the science of his time. This paper is intended to be a small contribution to understanding the problems in a Kantian framework, accepting that (contra Hume and Mill) there is something non-empirical about mathematical discoveries and accepting that what is discovered is neither trivial nor some sort of stipulation (as Quine seems to suggest). The topic, discussed inconclusively here, is how it is possible to discover constraints on possibilities for change in a triangle. I'll try to illustrate some forms of reasoning that turn up in geometry and can be understood by a child, which seem to be beyond the scope of current computer-based reasoning systems. Exactly why is not clear. I am not claiming they are impossible for future robots playing with spatial structures. Many animals engage in play: activity that can involve a mixture of variation and repetition that not done to meet an immediate biological need (e.g for food, drink, shelter, etc. ), is done alone, or possibly with an inanimate object (e.g. kitten with ball), or with one or more conspecifics, or with other animals, which may include humans. Emre Ugur's PhD thesis Ugur(2010), referenced there, shows how a robot with ABM can learn useful facts about its environment, and about itself, e.g. its capabilities and their limitations. His mechanisms demonstrate a possible way in which playful activity, done without any ulterior motive, may, as an unintended side effect, produce important kinds of learning. That may be part of the explanation of how tendencies to play first evolved. The side effects can include influencing the growth or strengthening of body parts concerned with the actions, discovering correlations between motor signals, sensory information, and other internal states and processes, discovering correlations between actions produced by the observer, and discovering what kinds of processes in the environment or changes of objects in the environment can occur, i.e. facts about what is possible. More generally, architecture-based motivation can produce learning processes that develop exosomatic concepts referring to structures and processes that can occur in the environment. Initially all that may be discovered is that various forms of process produce other changes, including changed information-processing. Later the play may create new experiences or new theories that require new concepts to be developed. As mentioned above, by playing with squares and trying to form regular arrays, a child may discover the need for a concept of primeness of a number. What's learnt in different contexts, performing different actions, may be correlations between actions performed in certain circumstances and consequences. Or it may be new kinds of possible state or process. Or it may be constraints on possible changes in certain structures. In some cases that can involve forming a new abstraction that applies to different situations. There are many such problem domains, or microdomains, that trigger development of competences in species, in social groups or in individuals who have a very good understanding of a rich space including representational and reasoning competences tailored to the domain. moving objects from one place to another in the presence of obstacles, gaps, etc. and many, many more. These all form what can be called 'domains' (or in some cases 'micro-domains') characterised by objects, properties, relations and types of change. Some domains are subsets of other domains. Sometimes two or more domains are found to have something in common that requires a more abstract ontology for its description (e.g. different examples of groups, in mathematics). Many such domains are explored by children and other animals, but have never been explicitly studied by mathematicians. (E.g. ways of putting on a sweater, shirt, vest, jacket, etc with neck-hole, waist-hole, and arm-holes/sleeves?) But that typically does not prevent them being mathematically very able. Many people think that competence in a domain involves learning reliable correlations in that domain. But there's a deeper kind of learning, about what's *possible* in that domain. Somehow, evolution developed mechanisms enabling animals to acquire a grasp of what's possible in certain situations, and some of the limitations on what's possible. These can be thought of as many domains in which proto-mathematical knowledge/competence develops. In the past few years I've been exploring lots of little domains that children can learn to explore and play with, several referred to in the lovely little book by Sauvy & Sauvy. For example. there's the domain of shapes that can be made with a rubber band and pins in pin-board, an outline capital "T" being one example, but not a capital "A". Another domain is the set of processes and patterns involved in discs placed in a rectangular grid and moved only diagonally. Not all domains use the same kind of knowledge and reasoning (e.g. logical knowledge). Many animals, and young children can acquire familiarity with a domain without being able to reflect on, or talk about what they have learnt. Humans sometimes can as they get older, though they may need help from a teacher, e.g. studying spatial structures and motions. Which domains get explored, and how far they are explored and what concepts and 'theorems' are produced is to some extent a collection of historical accidents. But the content acquired is not all empirical: there are structural constraints in a domain making some things possible, others impossible. There are also domains that involve kinds of stuff, e.g. rigid impenetrable stuff, or uncompressable fluids, or elastic stuff. Some domains include kinds of information structures and their relationships (e.g. entailment, contradiction). In general what's learnt in a domain can be decomposed and recombined so as to generate new domains. Mathematics is the investigation of such domains, which can take many forms, and can be done alone or in a social group. But those mathematical activities generate new domains and new tools for reasoning about them., in what I suspect is a never ending process, although every now and again a complex collection of domains is found to be be collapsible into special cases of one domain (e.g. groups). Moreover, some domains generate meta-domains, concerned with aspects of previous domains. Which domains have actually been discovered and investigated and what has been learnt about them is typically in part the history of biology or of a community of individuals, or a particular individual. However that such domains can in principle be found and studied (including many not yet discovered) is not a fact of biology or human history. Neither is it typically a fact about humans that a particular domain includes certain sorts of variety and certain constraints. Which primes, or which symmetric geometric shapes, are still waiting to be discovered is not a fact of human history, though it may enable some human futures. There's a lot more to be said about the variety of such domains, the cognitive (including motivational) mechanisms relevant to exploring them, and the ways in which previous domains can contribute to the construction or discovery of new ones. From this viewpoint emphasis on "the hard logical must", or on "what follows from what", just focuses on narrow aspects of the broad variety of mathematical topics that can grow out of products of evolution. In each case, requests for justifications of claims made are not to be based on deduction from axioms, but consequences of things discovered by inspection -- possibly after specifying what's included and excluded from the domain, e.g. flexible objects. In principle the investigation of all such mathematical domains could be done by robots. But in practice there are kinds of human reasoning about what's possible that seem to be very hard to implement on computers. I have been collecting examples from euclidean geometry. It could turn out that these forms of reasoning require development of a new kind of thinking reasoning machine, that may not be implementable on turing machines. I have an open mind. There's lots more to be said about this. I think it pushes in a direction no philosophers of mathematics that I know of have explored because they have generally not noticed the connections between human mathematical competences and related competences of other organisms, especially abilities to survey sets of possibilities and select something useful in the current situation. From this point of view, an important task for philosophy of mathematics is to provide an overview of this collection of domains of knowledge, of requirements for exploring them, of ways in which the knowledge gained interfaces with other kinds of biological information processing, e.g. abilities to act, to, communicate, to cooperate, to teach, to learn, to do science, to do engineering, etc. And to investigate the information processing capabilities required for the various kinds of discovery of and application of facts about possibilities and limits of possibilities in various kinds of domain. This paper, and the others below are all part of the Meta-Morphogenesis project, http://www.cs.bham.ac.uk/research/projects/cogaff/misc/meta-morphogenesis.html partly inspired by Turing's 1952 paper on chemical morphogenesis. http://www.cs.bham.ac.uk/research/projects/cogaff/misc/evolution-info-transitions.html This is a draft, incomplete, discussion of transitions in information-processing, in biological evolution, development, learning, etc. A discussion of the difficulty of using computers to model human geometrical reasoning, and related kinds of reasoning about affordances apparently done by some other animals can be found in http://www.cs.bham.ac.uk/research/projects/cogaff/misc/triangle-theorem.html using examples of very simple proofs of theorems about shape changes that increase or decrease the area of a triangle, or which produce a new triangle containing or contained in the old triangle. http://www.cs.bham.ac.uk/research/projects/cogaff/talks/#toddler PDF presentation: Why (and how) did biological evolution produce mathematicians? I think he came close, but did not quite get there, but I have read only the 1943 book. Many years ago at Sussex University I got to know Brian Goodwin. I did not understand everything he said, but I believe that his idea that there are "Laws of Form" that describe constraints on possibilities for reproduction and growth in this physical universe is obviously true. What is less obvious is that these Laws of Form can both restrict what natural selection is able to produce and also provide constraints that reduce the burden on natural selection. If some things are possible and others impossible in the physical universe, no selection mechanism is required to prefer the former. showing the connection between irrationality of square root of 2, and Pythagoras' theorem. https://www.youtube.com/watch?v=X1E7I7_r3Cw "What's up with Pythagoras", by Vi Hart. NB For many of her videos, you may have to pause and replay bits, to take in the details. http://hdl.handle.net/10289/5153 Catherine Legg, What is a logical diagram? Paper presented at Mini-Conference on Logical Pragmatism, Auckland, New Zealand, February 25, 2011. Erwin Schrödinger, 1944, What is life?, CUP, Cambridge. A collection of extracts relevant to this discussion, with comments, is available here (still incomplete in March 2016). I owe a particular debt to Ian Hacking who is interested in closely related philosophical and historical problems, but holds different views -- including having more respect for Wittgenstein's philosophy of mathematics. Offers of help in making progress will be accepted gratefully, especially suggestions regarding mechanisms that could enable robots to have an intuitive understanding of space and time that would enable some of them to rediscover Euclidean geometry. A feature that seems to be common to many biological sensory systems is noise, or randomness, and mechanisms for coping with noisy sensors or randomness in the environment seem to be found in many organisms. An important way of coping with messy details such as noise is to move to a higher level of mathematical abstraction ignoring the noisy details e.g. by using only information about topological relationships and partial orderings that are often impervious to (limited amounts of) noise and uncertainty. E.g. noisy signals can lead to uncertainty about the precise location of an object in a room, but without making some of the topological relationships and partial orderings involving the object uncertain -- such as which room the object is in, and which items are closer to it than other items. This can have deep implications for perception and intelligent decision making and planning.